Between May 22 and 25 over 500 million Europeans are able to cast their vote and decide which candidates to send to the European Parliament. More than 13 parties have launched their respective election campaigns. Recent developments such as the crisis in the Ukraine, and high energy prices across Europe make energy policy take a prominent position in the EU elections campaigns. So how important is energy for the different political groups? 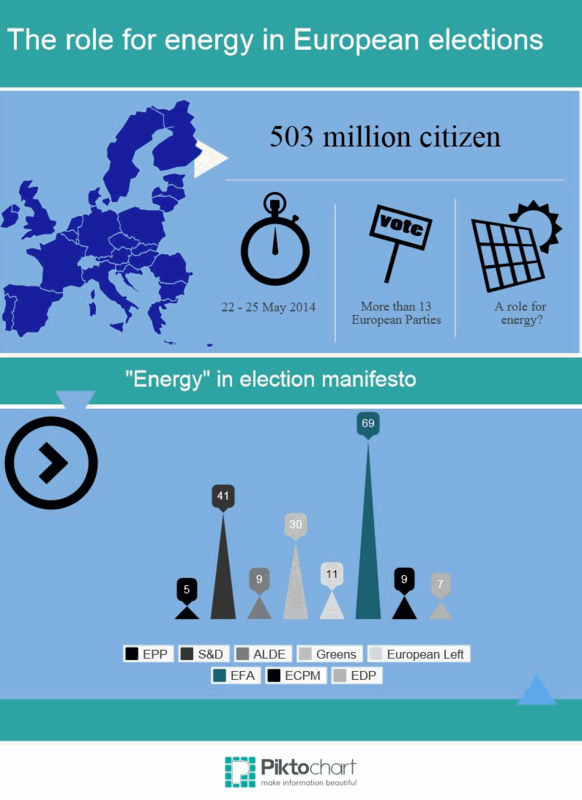 Below is an infographic which summarises how often the word “energy” features in the election manifestos of the various political parties in Europe. Of course this infographic is not an in-depth analysis of the energy policies of the different parties, however it does give us an indication of the priorities, and wider convictions of the various political groups. Except for the Pirates, all of the parties that do not mention energy at all are Eurosceptic or have strong reservations about the role the EU should play in defining citizens’ lives. It can therefore be inferred that energy policy is not mentioned because it is – to their mind – best treated on the national level. Looking into the Conservatives and Reformists’ manifesto, this is indeed confirmed by statements such as [It is] “vital that we maintain our energy sovereignty”. However, particularly in the context of the Ukraine, highlighting once more certain EU Member States’ dependence on Russian fuel supplies, a common approach to energy at a European level is vital. It would secure energy supplies and reduce import bills and dependency. The safest and cleanest way to do this is by further developing renewable energy, and reducing energy consumption through energy efficiency measures such as the insulating of buildings. Returning to our infographic, the party with the highest number of key words is the European Free Alliance (EFA), an alliance of regional member parties that strive for more autonomy of regions in the EU. EFA Members call for a “renovated European electricity network” and this dual policy advocates a super-smart grid to integrate solar energy from the Mediterranean, wind energy from the North Sea and hydropower from Scandinavia, integrating the regional with the European level. Looking at political think tanks there are policy proposals on the table, that go even further, such as the Jacques Delors think tank “Notre Europe” which has advocated a European Energy Community and before the Böll Foundation has presented the “ERENE” concept – a European Community for Renewable Energy. According to these visions a new energy community would give new impetus for EU integration through energy policy. Not only would the physical infrastructure connections tie Europeans tighter together but also create a spirit of solidarity. In April Polish Prime Minister Donald Tusk advocated a “European Energy Union” that should allow EU Member States to collectively bargain for better gas deals. There were positive reactions from numerous EU politicians (such as German Chancellor Angela Merkel, Liberals leader Guy Verhofstadt, Greens leader Rebecca Harms), also because there are many other aspects to gain from a collective EU approach. Reduced import bills, higher energy security, efficiency gains and a streamlining of energy policy to other EU objectives such as on emission reductions or economic development could be the benefits of an “Energy Union”. In May, Europeans citizens will decide on their preferred candidates and party. Looking at the different parties’ manifestos, energy policy can be seen as a microcosm of an overall vision of Europe, be that a scaling back of European powers or greater connection of the different regions within Europe. There is a long list of candidates for the post of Commission President, eventually responsible for major progress on energy policy together with the responsible energy Commissioner. It has to be ensured that energy is not just traded off in the tug-of-war around positions. Energy policy must be treated not as a pawn in an overall political strategy but as a priority for citizens, for the climate, for the health of our environment and our children. Politics is famous for focusing on the short term, but the decisions made this May could have repercussions far beyond the next five year term. Therefore and irrespective of political party we must be clear and united about an energy future for Europe which is viable for not just the next five years, but for the next ten, twenty and thirty. Heike Leberle and Grace Murray are both Advisors on energy policy at the Greens/EFA Group in the European Parliament.